September 15, 2016 – In June 2015, when the cameras on NASA’s approaching New Horizons spacecraft first spotted the large reddish polar region on Pluto’s largest moon, Charon, mission scientists knew two things: they’d never seen anything like it elsewhere in our solar system, and they couldn’t wait to get the story behind it. Over the past year, after analyzing the images and other data that New Horizons has sent back from its historic July 2015 flight through the Pluto system, the scientists think they’ve solved the mystery. 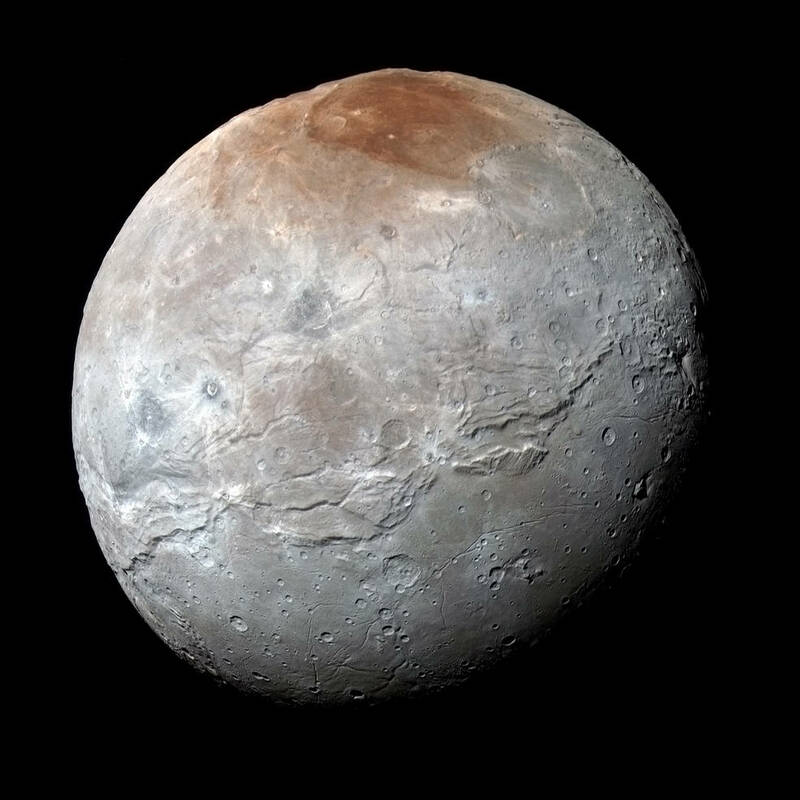 As they detail this week in the international scientific journal Nature, Charon’s polar coloring comes from Pluto itself – as methane gas that escapes from Pluto’s atmosphere and becomes “trapped” by the moon’s gravity and freezes to the cold, icy surface at Charon’s pole. This is followed by chemical processing by ultraviolet light from the sun that transforms the methane into heavier hydrocarbons and eventually into reddish organic materials called tholins. The team combined analyses from detailed Charon images obtained by New Horizons with computer models of how ice evolves on Charon’s poles. Mission scientists had previously speculated that methane from Pluto’s atmosphere was trapped in Charon’s north pole and slowly converted into the reddish material, but had no models to support that theory. The New Horizons team dug into the data to determine whether conditions on the Texas-sized moon (with a diameter of 753 miles or 1,212 kilometers) could allow the capture and processing of methane gas. The models using Pluto and Charon’s 248-year orbit around the sun show some extreme weather at Charon’s poles, where 100 years of continuous sunlight alternate with another century of continuous darkness. Surface temperatures during these long winters dip to -430 Fahrenheit (-257 Celsius), cold enough to freeze methane gas into a solid. “The methane molecules bounce around on Charon’s surface until they either escape back into space or land on the cold pole, where they freeze solid, forming a thin coating of methane ice that lasts until sunlight comes back in the spring,” Grundy said. But while the methane ice quickly sublimates away, the heavier hydrocarbons created from it remain on the surface. The models also suggested that in Charon’s springtime the returning sunlight triggers conversion of the frozen methane back into gas. But while the methane ice quickly sublimates away, the heavier hydrocarbons created from this evaporative process remain on the surface. Sunlight further irradiates those leftovers into reddish material – called tholins – that has slowly accumulated on Charon’s poles over millions of years. New Horizons’ observations of Charon’s other pole, currently in winter darkness – and seen by New Horizons only by light reflecting from Pluto, or “Pluto-shine” – confirmed that the same activity was occurring at both poles. New Horizons is the first mission in NASA’s New Frontiers program, managed by the agency’s Marshall Space Flight Center in Huntsville, Alabama. The Johns Hopkins University Applied Physics Laboratory designed, built, and operates the New Horizons spacecraft. SwRI leads the science mission, payload operations, and encounter science planning. Ball Aerospace built the camera (Ralph) that has delivered stunning images of Pluto and Charon. Students from the Laboratory for Atmospheric and Space Physics (LASP) in Boulder built the Student Dust Counter, the first student-built instrument to fly on a planetary mission.